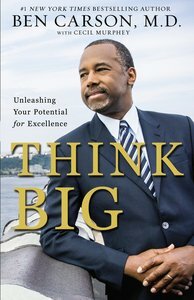 Dr. Benjamin Carson MD is professor and director of paediatric neurosurgery at Johns Hopkins Medical Institutions and the author of three other bestselling books, Gifted Hands, Think Big and The Big Picture. He overcame an inner-city background to become a world renowned neurosurgeon, widely respected role model, he shares motivational insights with inner-city kids and corporate executives alike. He serves on the corporate boards of The Kellogg Company, Costco Wholesale Corp., and American's Promise among others, and is an Emeritus Fellow of the Yale Corporation. Dr. Carson holds more than 40 honorary doctorates and has been named by the Library of Congress as one of 89 Living Legends. He and his wife, Candy, have three sons and live in Baltimore County, Maryland.